Despite dropping out of school in the tenth grade and not receiving any formal artistic training, Jean-Michel Basquiat went from an obscure graffiti artist to an acclaimed artist. After being discovered by Andy Warhol, his career really took off, and he is still admired by many celebrities to this day. Even Jay-Z was recently spotted wearing a t-shirt featuring his artwork. 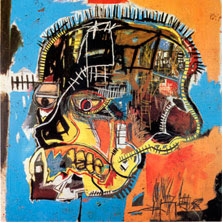 Basquiat used art as an escape from his chaotic personal life. Although he was an intelligent child, he had a mentally ill mother and had been in and out of institutions for years. As a homeless 15 year old, he began expressing himself with graffiti around New York, before concentrating on different artistic styles such as human anatomy. He attempted drug rehabilitation and sobriety, along with exploring different themes in his artwork to cope with his difficult past. His work often looked at racial oppression and slavery. Sadly, he died aged 27, but his work still reaches high prices at auction.